The Granite State safely travels an average of 9000 miles a year in search of whales- that's enough to cross the Atlantic three times! At 65 feet long, the Granite State is the perfect size to give passengers both the comfort of larger vessels and the personalized approach of smaller vessels. We are licensed to carry 123 passengers, but for your comfort, limit the amount of passengers to under 100 on all of our whale watches. Over the winter of 2010-2011 we re-powered the Granite State with two new Caterpillar Marine Diesel engines. We are now fully EPA Tier II emissions compliant. Our emissions of greenhouse gasses have been cut by over half and our fuel economy has risen as well! The Granite State is now one of the fastest whale watch boats in the area. We have the ability to reach both Jeffreys Ledge and the Stellwagen Bank National Marine Sanctuary in a half day trip. Our captains and crew members have over 100 years combined experience in operating passenger vessels. We enjoy our work and pride ourselves in being able to communicate our enthusiasm about the ocean environment to our passengers. Crew members and naturalists are always available to answer questions throughout the trip. We are New Hampshire's only full time whale watch! 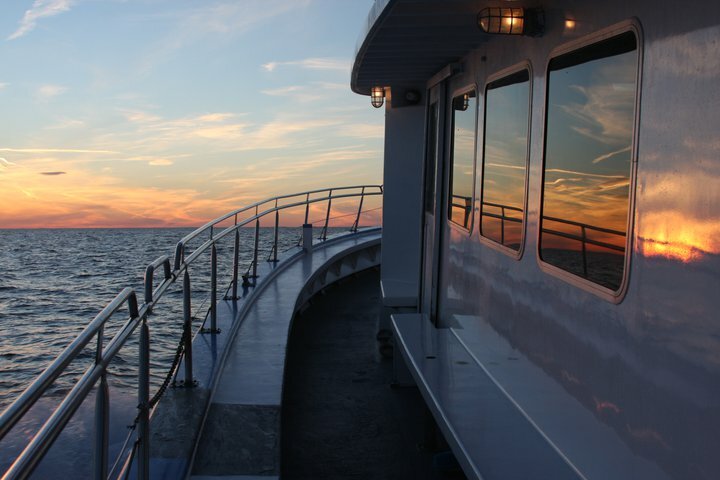 Our vessel is clean, safe, and specifically designed for whale watching. We are also the only non-smoking whale watch in the area.